The solution to simple to view a list of installed updates and uninstall the updates in Windows 8.1, 8, or 7! The show the list of installed Windows 8.1 updates, can be accessed via the Windows 8 Control Panel! In Programs and Features, Installed Updates. Or, using the command shell:AppUpdatesFolder in Windows Run dialog [Windows Logo] + [R]! If you want to uninstall one of installed updates, press the right mouse button on the appropriate update! 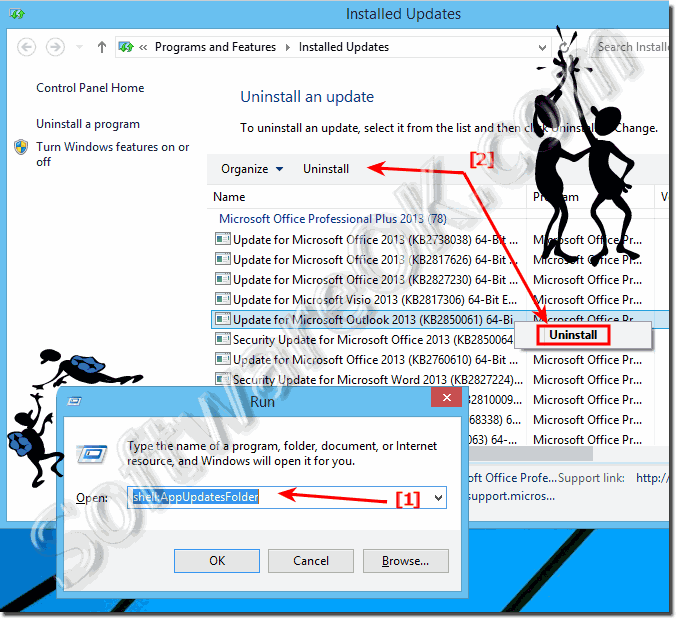 (Image-1) Uninstall ,Installed updates in Windows! Some Windows 8.1 updates apply to files or services that Windows is using, so these updates can't be installed while Windows is running. You should save your work, close any open apps, and then restart your PC to finish the update process in Windows 8.1. If you need more free space on your hard drive for Windows 8.1 updates, you might need to uninstall apps, delete your temporary Internet files, delete files that you don't use, or empty the Recycle Bin, and then try again to install updates. To check the amount of space available on your Windows 8.1 hard drive and see what can be freed up, you can use the Disk Cleanup tool that's included in Windows. Windows-8 - FAQ-183: Show installed updates or uninstall in Windows 8.1, 8 or 7? To see how long has the Windows 8.1 or Window 10 Computer been running, the solution is simple, or to see last restart time or Install-Date Content: 1. Check installed updates win 8.1? View installed updates windows 8? Installed windows updates show windows 7? Show what win 8 .1 updates are isntalled? Windows 8.1 program update uninstall is not showing? Windows 8.1 remove installed update? List of installed updates windows 8.1? Where is update list folder in win 8.1? List of updates installed windows 8.1?